St. Michael’s is the largest Renaissance church north of the Alps. It’s so large it was built in two stages, 1583-1588 and 1590-1597. Its barrel-vaulted roof was second only to St. Peter’s in Rome. It was damaged heavily in WW II but restored shortly after the war and additional work was done in the 1980s. We didn’t go to the tombs area but among those laid to rest here are Duke Wilhelm V (who had the church built in the first place), “Mad” King Ludwig II, Emperor Maximilian I and King Otto of Bavaria. 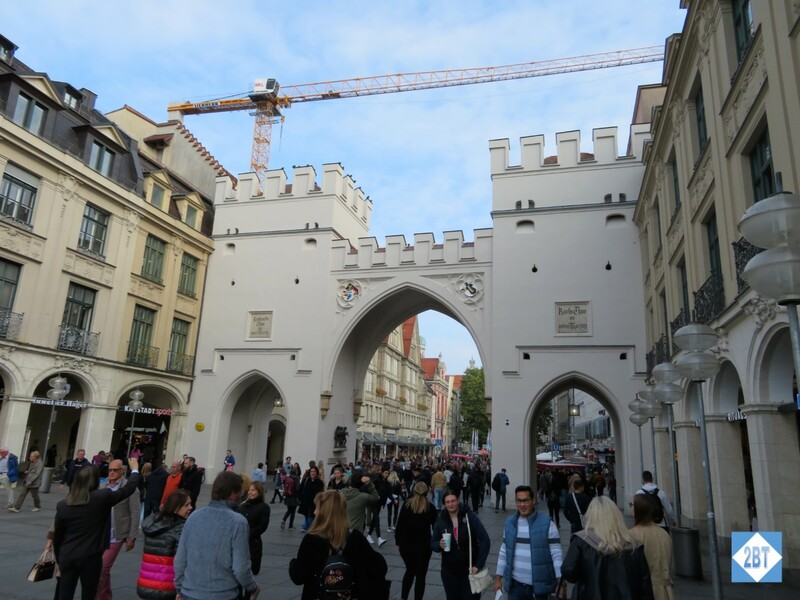 St. Mary’s Plaza was once a marketplace in the center of Munich and it remains the city’s heart. On the weekend we arrived a music festival was wrapping up with lots of folks and tents covering the area. 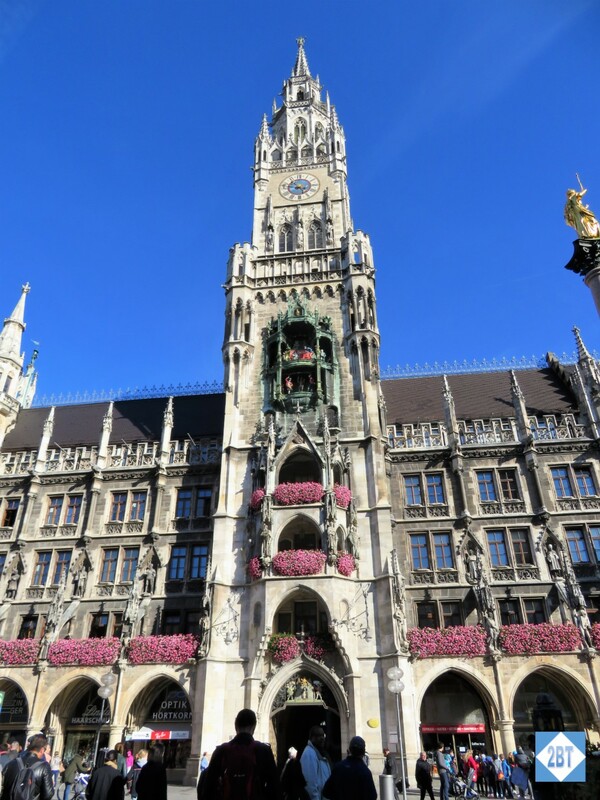 This area is home to the Neues Rathaus (New Town Hall) and its famed Glockenspiel. Of course “new” is a relative term and in this case it means the building was built 1867-1909 to relieve the overcrowded Old Town Hall which dates to the 15th century. 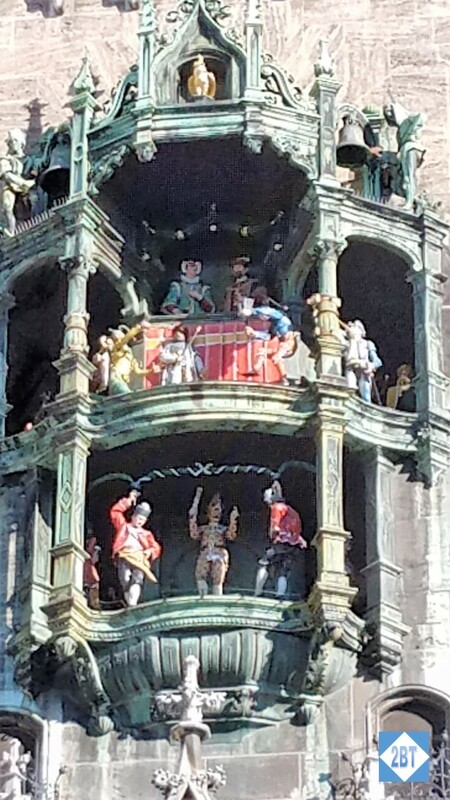 The Glockenspiel plays at three times each day (11 AM, 12 noon, 5 PM) and crowds gather to watch the figures dance and twirl the Schäfferltanz or Cooper’s dance, which was originally performed in 1517 at the Marienplatz to commemorate the end of the plague. 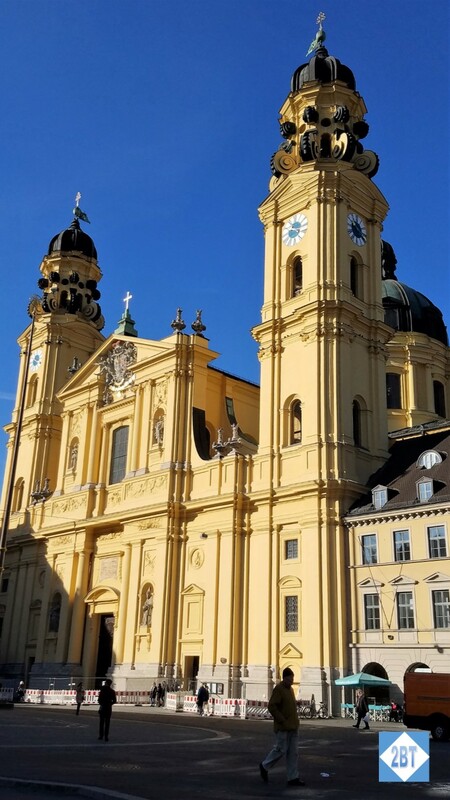 There’s also a large column in the plaza known as Mariensäule or St. Mary’s Column and it was erected to celebrate the end of the Swedish invasion in 1638. The statue of the Virgin Mary atop the column is actually older, created in 1590. 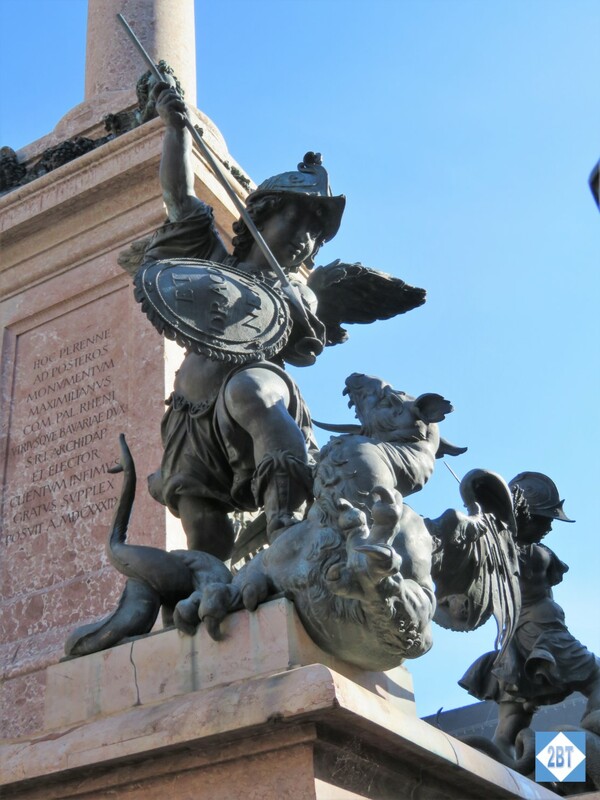 With so many people around I couldn’t get a good shot of the column but on each corner of the pedestal is one of these creatures, a putti (aka a cherub), fighting a creature representing one of the things the city has overcome: war, pestilence, hunger and heresy. Walking in neighborhoods behind our hotel, we turned a corner and found the imposing St. Paul’s Church towering at the end of a street. It’s “new” by some standards as it was completed in 1906. We didn’t go inside as there was a service going on. 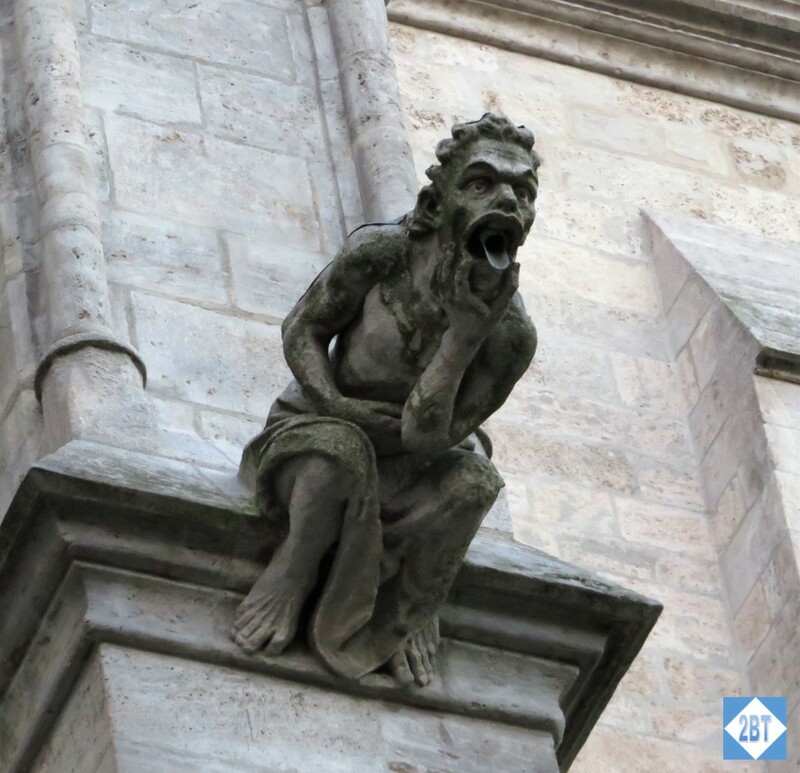 This gargoyle doubles as a downspout! It’s hard NOT to notice this bright yellow building on Odeonplatz which evokes the Mediterranean. Designed by Italian architects its creation was ordered to celebrate the birth of Prince Max Emanuel in 1662. It’s also known as St. Cajetan’s Church as St. Cajetan was born Gaetano dei Conti di Thiene and co-founded the religious order known as the Theatines. 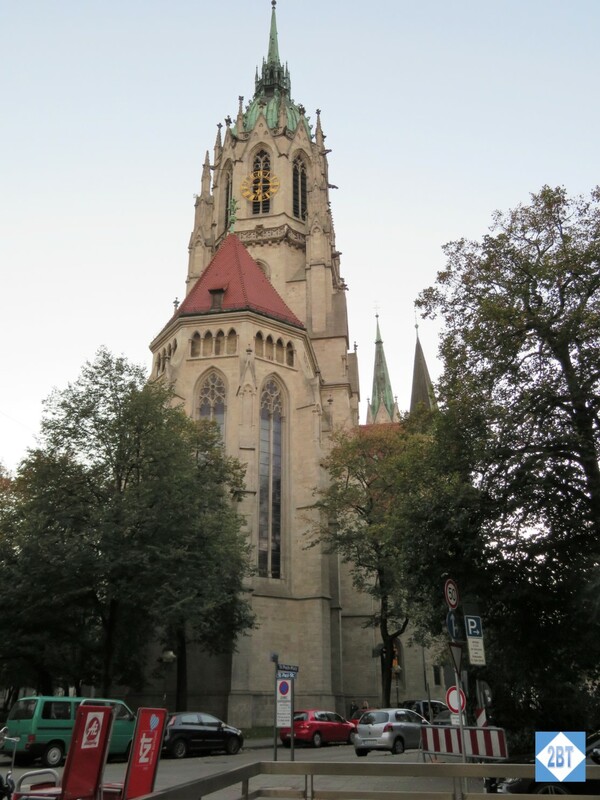 Its Rococo style and white stucco interior give it a different feel than other Munich churches. 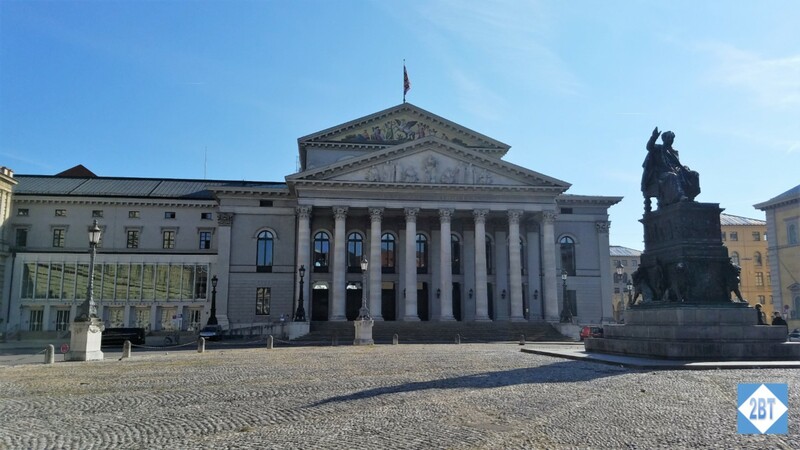 Right across the street from Theatinerkirche is this landmark, known as the Field Marshal’s Hall. Built in the early 1840s it sits at the site of one of the city’s former gates. It’s designed as an open colonnade and is modeled after one in Florence. The statues inside are some of Bavaria’s most revered generals. In 1923 this was the site of a clash between the Bavarian police and followers of Adolf Hitler. The supporters began the “Beer Hall Putsch (coup)” at one of the city’s largest beer halls and marched toward Feldherrnhalle to start the “people’s revolution”. When they failed to obey the state police’s orders to stop, the police opened fire and 16 marchers were killed as were four policeman. Following this march, Hitler was arrested and imprisoned for a short time. 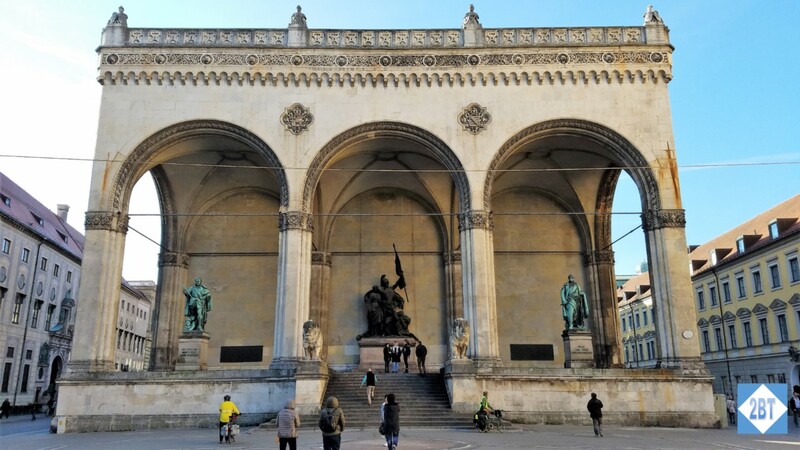 This plaza is named for the first king of Bavaria, Maximilian I Joseph. That’s his statue in the middle of the square. It dates to 1835. The building in the back is the Nationaltheater, which is the grand opera house. The building has twice been destroyed: once by fire just five years after it was completed in 1818 and a second time during the war in 1943. This version was built 1958-1963. I just love the Olympics so was thrilled that this was a stop on our hop-on/hop-off bus. 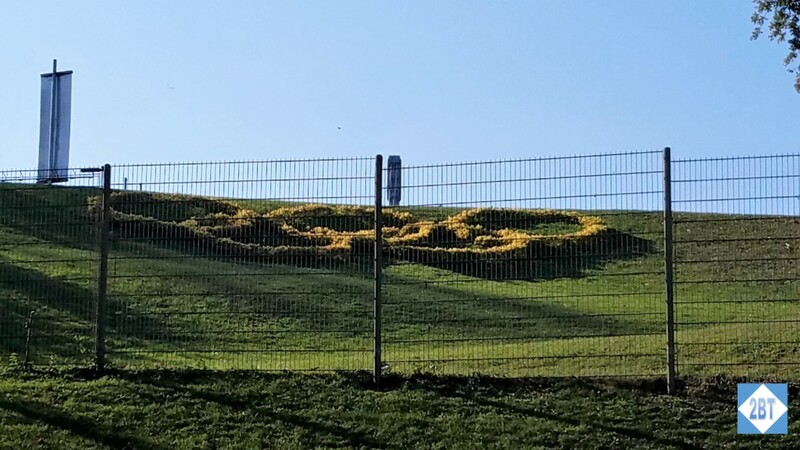 Though it was quiet – there were no events going on – it was nice to see that the park was in use by folks strolling around on a sunny day or jogging the trails. It’s so small by today’s gargantuan Olympic standards but that’s part of its charm for me. I was a little disappointed there was no Olympic memorabilia in the gift shops but I guess when the games were 46 years ago that licensing agreements were a little different. This lovely patch of green in the city was Munich’s first city park and was opened in 1792. It’s known as an “English” Garden due to the style of landscape, which is casual rather than rigid. We saw lots of people with children enjoying the afternoon, playing frisbee, reading and just enjoying the weather. At 910 acres, it’s larger than NYC’s Central Park. 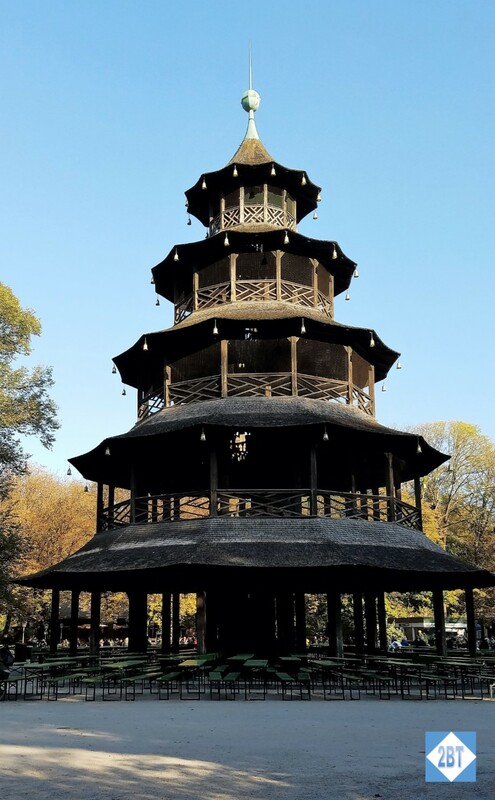 The Chinesischer Turm (Chinese Pagoda) was built as an answer to the pagoda in London’s Royal Botanical Garden. The tower was built in the late 1700s and was bombed in WW II. This version was rebuilt to the original design and houses Munich’s second-largest biergarten. After leaving the English Garden we were walking to the bus stop and couldn’t help but notice this modern sculpture. 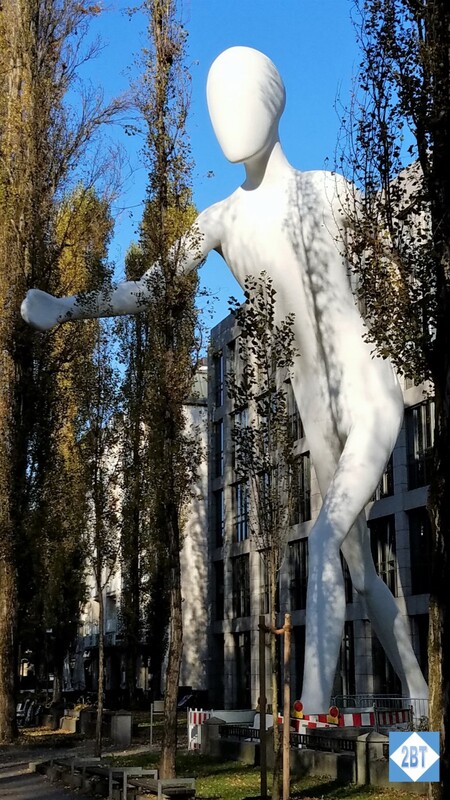 It was created in 1995 and stands 56 feet tall. 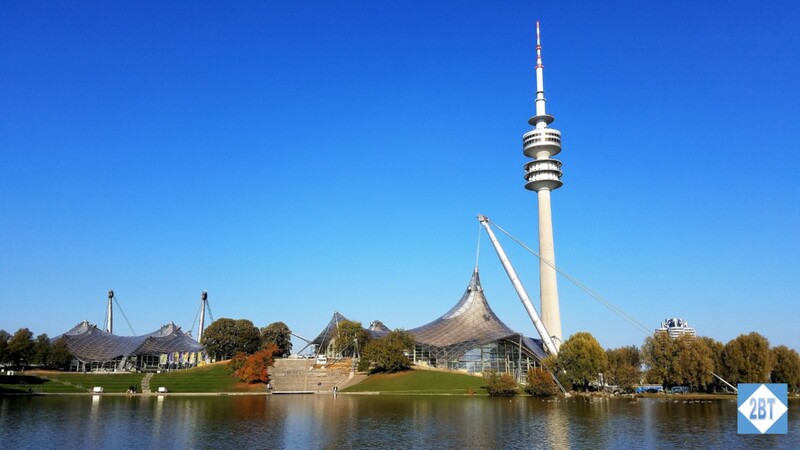 Created in Los Angeles, it was shipped to Munich in nine pieces. He certainly makes you do a double-take! Our bus stop was quite close to this Victory Gate, commissioned by King Ludwig I and built 1843-1852. It commemorates the bravery of the Bavarian army and its success in the Napoleonic War of liberation. 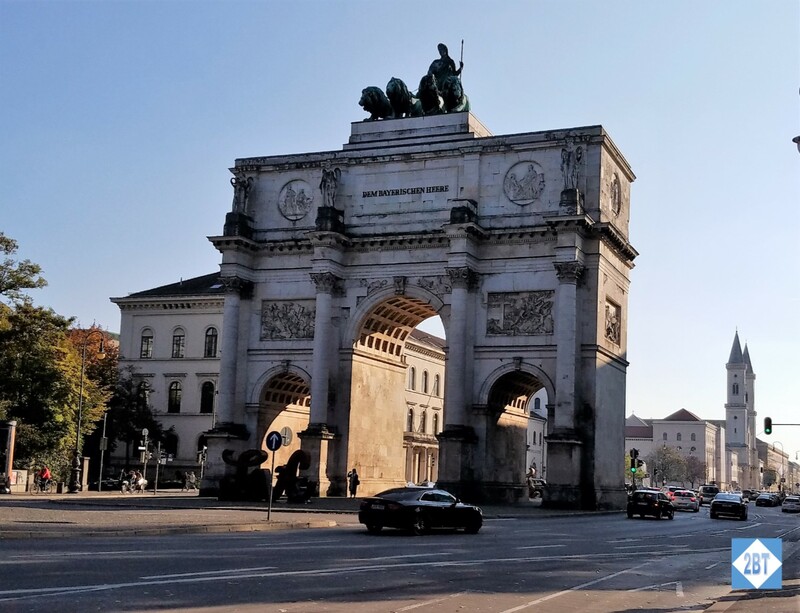 It sits on Ludwigstraße (Ludwig Street) and at the other end of the street is the Odeonplatz at the Feldherrnhalle, which also honors the Bavarian army. And that’s what we could get crammed into a couple of days in Munich. It’s a lovely city and I’d love to return at some point. Also, a big thanks to A View on Cities for help with the research for this post.